can some one tell me what my husbands Grandfathers uniform ranks are. They all seem to be different. William Nicholls was in the 2nd Battalion Essex Reg 56 front and served most of the time in India in WW1. Some description of Sergeant, but the one on the right is odd (to me): he's wearing sergeant's rank but an officer's unitform. the photo of him in khaki looks to have a crown above the stripes suggesting Staff Sergeant. Interests:Researching and collecting militaria to the Northumberland Fusiliers from the raising of the regiment to 1968, and the new Royal Regiment of Fusiliers from 1968 to present day. My other interests are the study of British Army in general, and in particular units raised during the Great War, especially the Volunteer Training Corps/Volunteer Force. Both Warrant Officer's 1st and 2nd Class, were allowed to wear officers uniforms, but the WOII was eventually barred from wearing them, the privelage remaining with the WOI. In this case he's either a Staff Sgt within a Corps or a Company Quartermaster Sgt of an infantry unit. There was a rather confused period when the old Staff Sergeant grouping that had existed for many years began to break up, with some of its grades (classes) becoming warrant officers. This happened over a number of years and was a difficult time as some of the appointments gained in status and others lost status. In mounted units the Troop and Squadron Sergeant Majors (TSM/SSM) initially continued to wear three stripes with a large crown over, as later did Company Sergeant Majors (CSM) of infantry units. 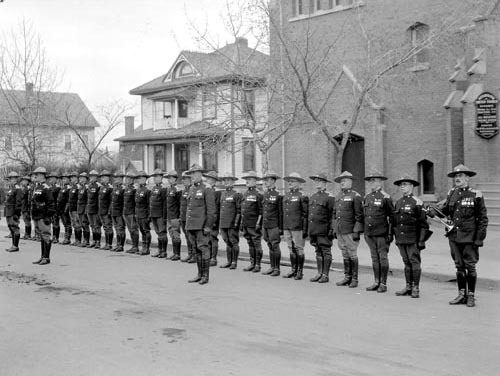 When khaki drab service dress (SD) was introduced in 1902 the Staff Sergeant grouping 'expected' to get superior pattern uniforms, just as they always had, and in many units initially began to wear officer patterns of the new uniform. At first this had a closed neck, but from 1913 it began to be worn by officers with an open, stepped collar and a shirt and tie, and in some regiments those men of Staff Sergeant grade followed suit. In 1913-14 the TSM/SSM/BSM/CSM still wore 3 stripes with large crown over on that uniform, as is seen in your photo. From 1915 on the TSM/SSM/BSM/CSM became warrant officers of a new, second class, and his badge of rank became a plain crown worn on the lower cuff. WW1 led to continued change and, by its end, only warrant officers of the first class were permitted to wear officer pattern service dress. In all of your photos I would say that the man shown is a pre 1915 Sergeant Major. The wearing of a sword with buff knot on the hilt is significant in that regard. His uniforms are deceptive and do not at first examination appear to be those of the Essex Regiment, being of a pattern worn only in India, where full dress was not issued and various types of frock worn instead, in this case a patrol frock, with Staff Sergeant pattern lacing to collar and cuffs. 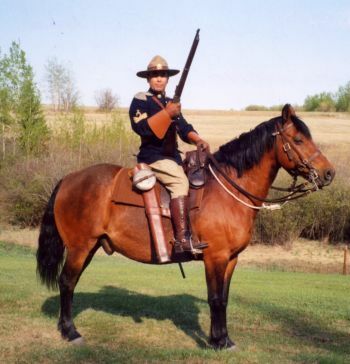 He wears the crossed rifles in the white uniform, which was more common for infantry than other arms, so it is possible that he could be of that regiment. Is it feasible to do a close up of his cap and collar badges worn on the khaki SD uniform? 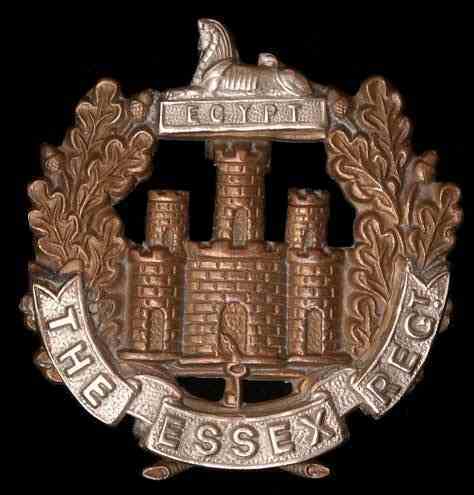 If he is Essex Regt then his rank is that of Company Sergeant Major (CSM) over the period 1914-15, when the previous Colour Sergeant rank was changed, as part of an infantry reorganisation, from 8 companies to four (double) companies. Four of the Colour Sergeants (the most senior 4) became CSMs, and the other four Company Quartermaster Sergeants (CQMS). The 2nd Battalion Essex Regt (old 56th Foot) were not in India before WW1, but the 1st Battalion (old 44th Foot) were and were at Quetta between 1909 and 1913, when they went to Mauritius (at that time an outstation of India and served by units on rotation from the Indian Establishment). This period would fit with the uniforms shown and it was common for men to move to and fro between the two battalions at least once in a career. 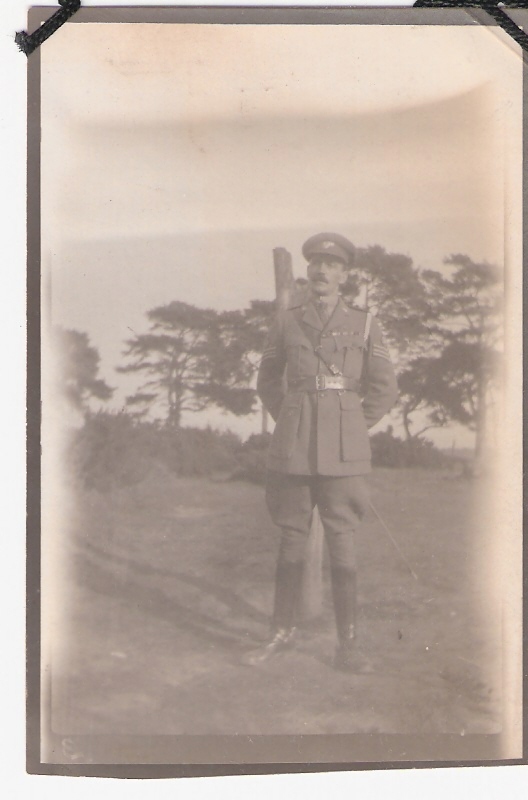 The photo of him with officer pattern khaki service dress and Sam Browne belt, with the then CSM badge of rank of three chevrons surmounted by a crown, is extremely rare. Thank you so much for all this info. My husband said he think he had something to do with horses as well and that shows in a photo attached also a photo which must be after the war back in the Uk whether that is the essex 2nd Battalion I do not know the uniform william is wearing on the right behind the leader . Not having any joy at getting his war records so we know very little about his involvement . We are grateful for the help you have given it is much appreciated. forgot to say I tried to enlarge the army photo you requested of the hat and collar but it was too blurry may see if I can get help and resend again. 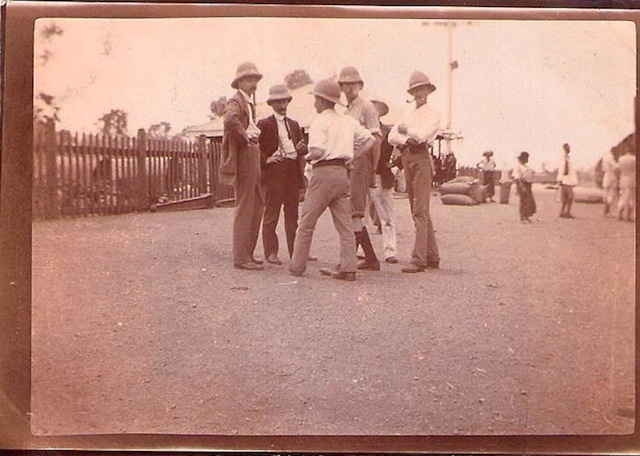 The first photo shows men either, in India, or South Africa. I mention the latter because the 1st Battalion Essex Regt (old 44th Foot), went to South Africa from Mauritius (see my last post) between 1913 and 1914, when the outbreak of war led them to return to the UK and then to France. All the men are wearing Wolseley pattern foreign service (tropical) helmets, as were worn in the countries that I have mentioned, but not at home. It is unsual to see a group of infantrymen mounted in that way unless they are members of the battalion's "mounted infantry section" (about 26 men), which all infantry battalions overseas were required to maintain at that time. As well as 1st Battalion Essex, going from what you have said, it is possible that the photo shows him in an Indian Army unit, but this seems a long shot as all the men are quite clearly europeans. N.B. You persist in mentioning only the 2nd Battalion Essex, old 56th Foot (as opposed to "56 front"), but keep in mind that the 2nd Battalion were not in India in the time shown. 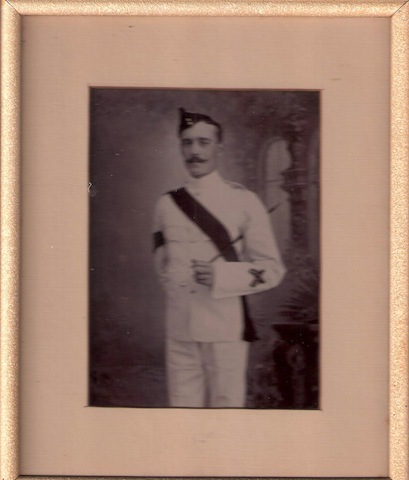 He would have moved between the two regular battalions and so he is most likely with the 2nd Essex in the photos with white helmet and probably in Malta circa 1904, and then moved to the 1st Essex (old 44th Foot) and India in the photos in khaki. This would explain the family 'history' of his service in India. These latter two photos show the Wolseley pattern helmet again and the background scene looks more like South Africa than India, which again would fit with the 1st Battalion Essex Regt circa 1913. 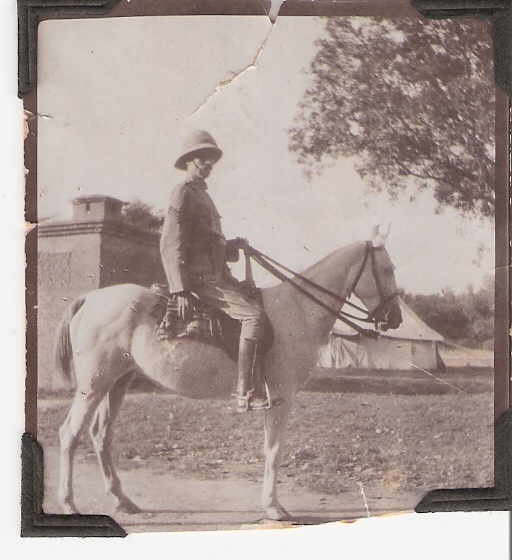 The mounted photo seems to show a small type of horse, rather than a thoroughbred that a cavalry unit would be mounted upon. Smaller types of horse were used by the battalion mounted infantry sections that I mentioned in the previous post. I don't often differ from Frogsmile but think there is a little more to be said. Sergeant-major, bandmaster, QM sergeant, Orderly Room [OR] sergeant, sgt -drummer, -bugler, -cook, C/Sgt Instr Musk, band sgt, sgt master tailor, sgt master shoemaker all armed and accoutred as staff sgts including a sword. Note that the rank badge of those not in bold type would not fit the photos. The second photograph, in SD, is a problem because he appears to be in riding boots. I can not think he is the Transport sergeant because it is clear that he is too senior. He has too many medal ribbons for pre-war, or even during the war. I wonder if he is British Army at this stage? The third photo is almost certainly India and I believe the earliest of the three. I can only see three chevrons which would make him a sergeant or lance-sergeant. I don't think that we have materially differed at all. I have not mentioned the detailed appointments of the Staff Sergeant grouping because I did not want to confuse the OP, who has only recently joined the forum, and is clearly not a seasoned study of the arcane organisation and uniforms of the British Army at that time. I tried to keep it as simple as I could, having some sympathy for how complicated it must seem to someone with no military knowledge trying to understand a forebears service and rank. 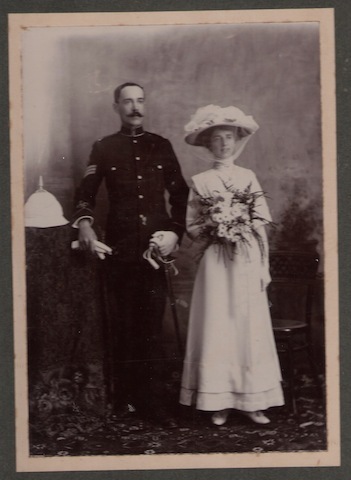 I agree that the photo in best whites could be as a sergeant from an earlier period in the man's career, but from the angle that he is standing I personally could not confidently say that there is no crown above his chevrons, and he would not necessarily be wearing a belt in that dress when not on parade. The crux of the matter is the photo in khaki SD. The open, stepped collar was not introduced for khaki (wool) SD until 1913 and, at that date, the badges of rank he is wearing would be correct for a battalion that had adopted the 4-company organisation and converted 4 of its Colour Sergeants to CQMS and 4 to CSMs. It seems logical that only the latter would have been permitted Sam Brownes, in some mistaken perception that they should, to a degree, emulate the battalion level Sergeant Major in dress. CQMSs' would likely still have been using the sword belt and carriage (aka 'slings') long worn by the Staff Sergeant grouping. Frogsmile thank you. But I cannot get over his boots! Surely they are boots riding? Yes indeed they are and, as you will see from the other photos that there seems to be an association with the mounted infantry (MI) section of the battalion, I can only hypothesise that the riding boots are worn accordingly. I mentioned this possible MI connection in the subsequent posts. He is also wearing riding boots in the most recently posted picture where he is mounted. well the jig saw may well be solved. yesterday after reading everyones comments we pulled out a large chest that had not been looked at since my mother in law passed away in the 1990's . We have had a real shock with the findings . .The memoirs about the war in india all typed out by my husbands Father before he passed away. it took nearly all day to read and found badges etc also . will upload the photo of the badges as well. As some we do not know. Thanks Guys be patient as will be worth it . I am looking forward to seeing your findings with genuinely bated breath Maggie. Both I and fellow forum member Grumpy have been cogitating over this matter, as there was so much confusing and sometimes contradictory photographic evidence. What I have attempted to suggest is really a best shot based on the evidence that can be seen in the photos. I cannot emphasise enough how extraordinarily rare and unusual is the photo of your husband's father in khaki, officer style SD, but with a Staff Sergeant level badge of rank on the upper arm. I would go so far as to say that I doubt very much that the National Army Museum has such an image, and many historians would assert that such a combination was impossible! The period 1902 to 1915 was a very unsettling one for the dress and status of the Staff Sergeant grouping, especially in infantry battalions. Extracts taken from William Nicholls son born in India. I was born in Karachi in what was then British India and now Pakistan on 14th January 1913 of English parents.. Father was a Sergeant ex the Essex Regiment 2nd Battalion , that is on transfers from British regiments serving in India were not uncommon and were made for opportunities of promotion , better conditions and prospects of active service . At the time he was serving on the staff and had under gone a staff college training course at H.Qin Quetta. This was evidently largely clerical and administrative but was an asset to him throughout his working life. He was born a soldier and had never wanted to be anything else. 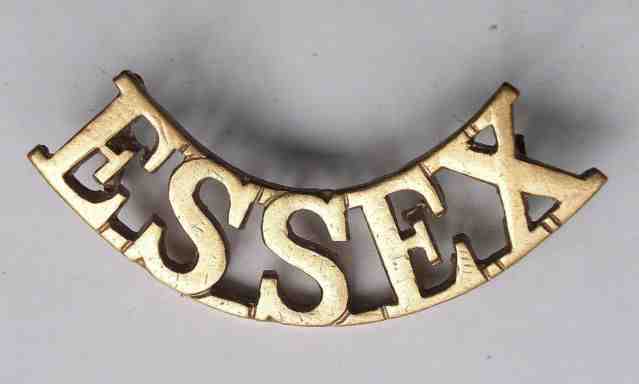 Enlisting at 18 in the 2nd BN Essex (56 Foot- old designation) . he had been stationed in Malta, and then on to Burma -eventually to Fort Dufferin, Mandalay. here under rather romantic circumstances he met my mother mother then a nursemaid to the family of one of the local district commissioners .My parents never spoke about about their time in Burma but it was a colorful country , bush green jungle, tropical climate but not unbearable . Into this bustling brillaint scene strode Sergeant William Nicholls ,tall, dark handsome , tanned in white tropic walking out uniform, maroon sergeants sash, stripes gold on black , marksmans badge and side cap in the same colors , complete with swagger cane. Small wonder nursemaids heads turned.I think .From a few faded brown photos it was obvious that there was quite a social life -picnics, excursions and visits of interest etc, . 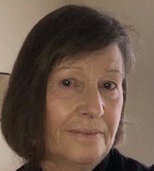 I think mother was happy working for the local commissioners family and to exchange this for army life did not appeal the family returned to England in 1910 . we know that to be correct because they landed back in London the King Edward V11 was dying. Meanwhile the regiment in turn had been posted to India in the course of its overseas tour of duty where exactly is not clear -Quetta, Bangalore, Krachi? anyway that is where we find Dad pursuing his army career as a member of the gilded staff and no doubt pursuing his broken romance by correspondence. He must of been an avid writer as the following year they got married in Karachi, Dad in a blue staff full dress with white spiked topee and sword . Mother in a lovely dress with one of those dreadful flowery edwardian hats. About this time my Father became friendly with a family called Naylor , and the husband encouraged him with his studies and work and also taught him to ride which he quickly mastered becoming an accomplished horseman .They welcomed his bride into the the family circle and proved very good friends to them indeed. Just what their position was I dont know -possibly Indian Civil Service. Certainly not Army . As to studies -for some years enlightened administration in the Army had introduced education to the rank and file in a big way. No longer was illiteravy tolerated -there was a 3rd class, 2nd class, and 1st class Army Certificate and dad making up for the deficiencies of having to leave school at an early age , worked his way through the lot, finally attaining the 1st class certificate . This would today equl todays school certificate but with empahsis on military history , english and maths..
twinkled in the sun and a Sam browne belt polished like old mahogany .At some time after he returned to India dad must of transferred from his staff job probably his horsemanship and love of horses made him look for a mounted unit instead of infantry in which he had orginally trained no doubt he would of liked to join a cavaltry reg but this would probably have entailed a drop in rank which as a young married man he could not afford . anyway he had taken the next best thing S& T Corps or supply and transport which formed a large part of the Indian Army Service Corps or R.I.A.S.C. as it became known in fact the whole indian economy relied heavily on horse and mule and even bullock transport Dad had gone to the Mesopotamia campaign in this capacity with the 3rd Mule Corps He survived various hazards of war --a bullet thru his saddle near capture by a turkish patrol when out in the dessert with one of his indian sergeants and participation in a baynet charge on Turkish trenches for which he duly reprimanded . Marlaria was the scourge of troops operating in hot climates there was no penicillin or antibiotics only quinine . he fought against it but finally had to be dragged off to hospital and eventually invalided back to india Although he he volunteered for active service again and again he never got away, being recalled on every occasion he was i think a victim of his own efficiency . too valuable in training and forming other units to be allowed to go. This must of been a bitter blow for him as the war took its course and the years went he became senior NCO of the 59th pony corps About April 1919 The 59 pony corps was ordered to the frontier in preparation on the North west frontier with Afghanistan As dad was busy mother had to pack all our belongings and alot of things had to be left behind. At last we moved off and dad joined us for a brief restThe station we pulled in seemed to bec seething wild eyed mob . dad locked me in the carriage and went to see what was happening The station master had been murdered there was rioting and the tracks torn up behind us there was no return to Jullundur even if one wanted to .Mother and I sat in the carriage fearful but fascinated. The crowds continued to swirl around the platform and I sat glued to the window . A wild ragged fellow stopped and peered in at us and mother hastily called me away from the window and made me sit on the centre seats These private carriages were quite roomy above the windows were bunks to pull down to sleep on . Mother bought food for the journey so we had plenty to eat . Men and horses also traveling on the train had to be feed as well. 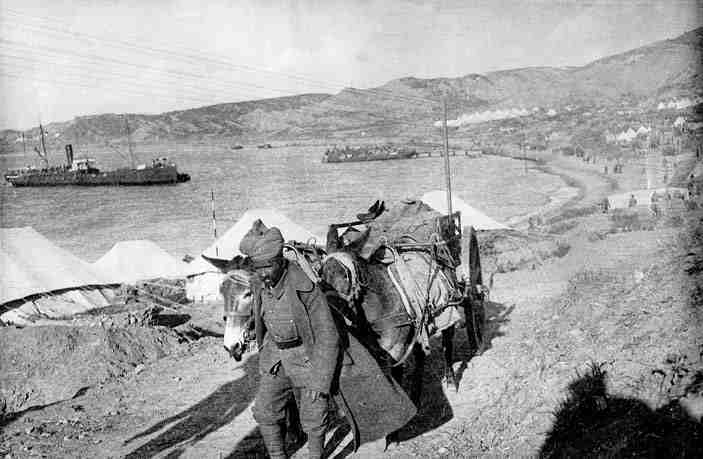 Eventually we were able to pull out and continue our journey and the last i remember was looking over the tracks on the other side at a patrol of about 6 Ghurkas and a corporal with fixed bayonets making their way along the lines . And a reassuring sight they were too. . ...one more section to follow . Hope you are not finding this story boring. news from Dad and the course of the war was spasmodic He was battling the heat and the danger of getting his convoys up and down the Khyber pass he trough himself into the tasks of getting the 59 pony corps equipped and fully ready for the action.This did not go unnoticed at head quarters , But fortune and or fate was against him . 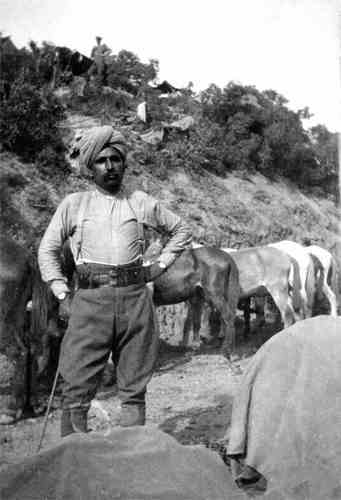 The great war just finished had taken its toll of regular and trained men from the indian army which in addition to supplying troops to other fronts had mainly conducted the Mesopotamia campaign entirely . replacements sent out from Britain had been largely territorials , conscripts etc who had enlisted for the duration only. Not many were keen to be involved in a minor border war fought under the heat, dust and conditions of summer in the barren rocky hills and mountains of Afghanistan. sickness was rife and malaria quickly took its toll. 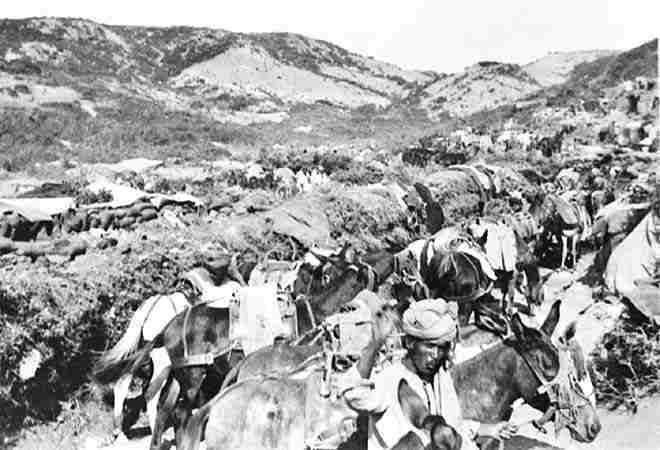 the experiment using ponies proved a failure , other horses were hardly enough to stand up to active service conditions and had to be replaced by mules.Not that mules made any difference to Dad- he had trained with the mule corps and had gone overseas with the 3rd Mule corps Re-organisation, nevertheless took time and frayed tempers and morale.COs and other senior ranks came and went as the campaign wore on but Dad determindly battled on and refused to go sick To be brief the Afghans were defeated and Amanullah sued for peace in August. The rather hasty end to war left the tribes in a state of complete unrest , leading to further operations in Wazinistan in 1921 -1922. Dad was given 6 months rest and recuperation his condition required at least this time in a temperate climate. So once more we were on the move This must of have gone some way to restore his spirits and morale . he at once ordered new serge uniforms (dark green khahi instead of the thin indian drill) and they were new officer type pattern with lapels and collar and tie . The indian army was in advance of its time in extending this style to its senior NCOs and WOs. in this he looked very much the officer even if he lacked the rank. as a snap shot in one of the albums shows. I have only briefly gave an account of life of my husbands grandfather after finding this account yesterday . ( 56 pages ) and what some of you have said about uniforms has been correct and written here. here are the badges we found yesterday as well. We cant find the connection with the east surrey one though. Maggie May badges .jpg Can't find the connection with the east surrey one though. 1. 2nd Battalion Essex Regt (old 56th). Serving in Malta. Here he seems to have started his clerical training. It was in this unit that the white uniform and white helmet was worn. The facing colour of the old 56th was a dark purple and this is very probably what was perceived as the 'black' cap and backings to his rank badges. 2. 1st Battalion Essex Regt (old 44th). Moved across from 2nd Battalion. Served in Burma and then India, where he continued his clerical duties, probably in the battalion orderly room. His appointment was almost certainly as 'Orderly Room Quartermaster Sergeant' (ORQMS), whose badge of rank was three stripes with crown over and, before 1915, had been titled 'Orderly Room Sergeant'. 3. Transfer to the Supply and Transport (S&T) Corps. 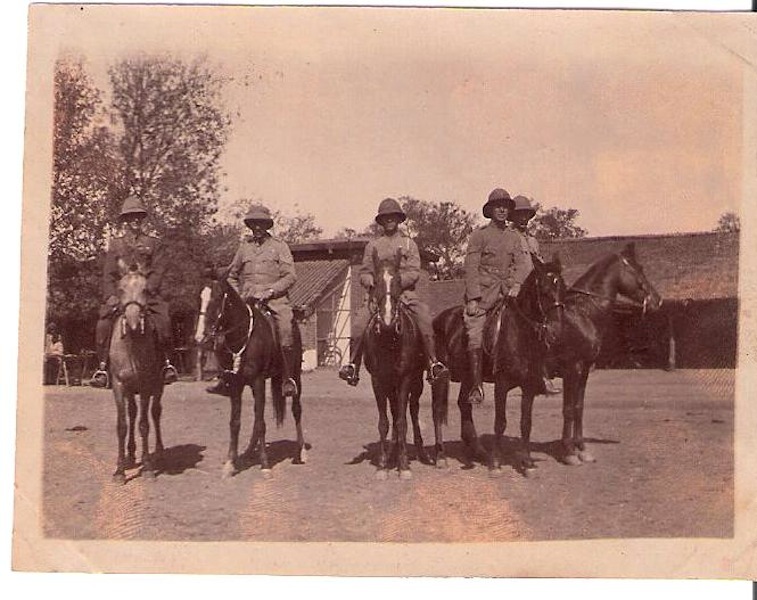 Serving with Mule Companies in Mesopotamia during WW1 and then with Ponys in Afghanistan on return to India in 1919. It was in this Corps that he wore the officer style SD with a Staff Sergeants badge of rank. 4. 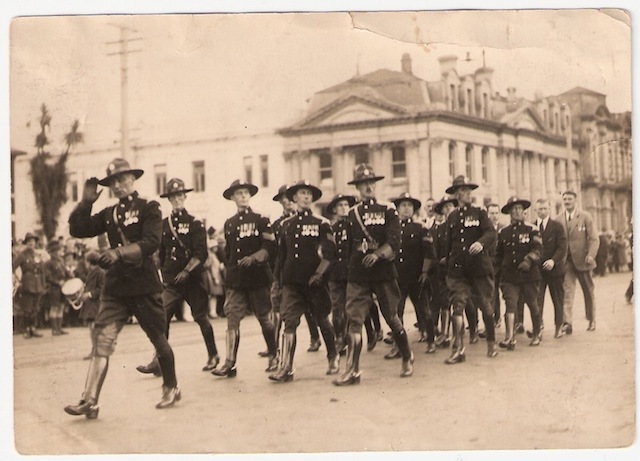 At some point he joined the Legion of Frontiersmen, probably in the 1930s, as the marching group in the photo appears to be from the Coronation of King George V1. 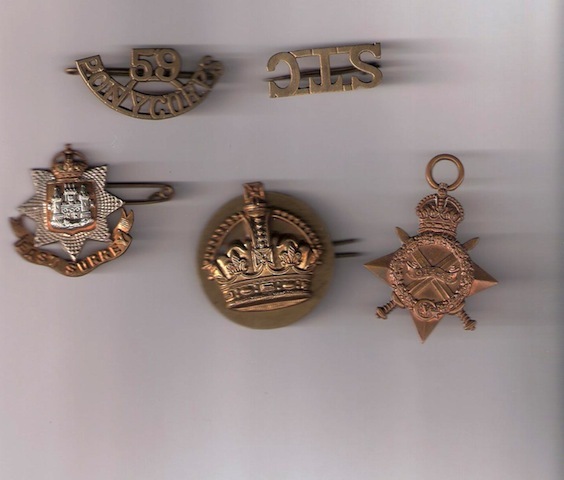 The crown badge at bottom centre of your group is that of a Warrant Officer 2nd Class. This was the new rank that many Staff Sergeants were converted to during the period between 1915 and 1918. The badge was worn midway on the forearms. 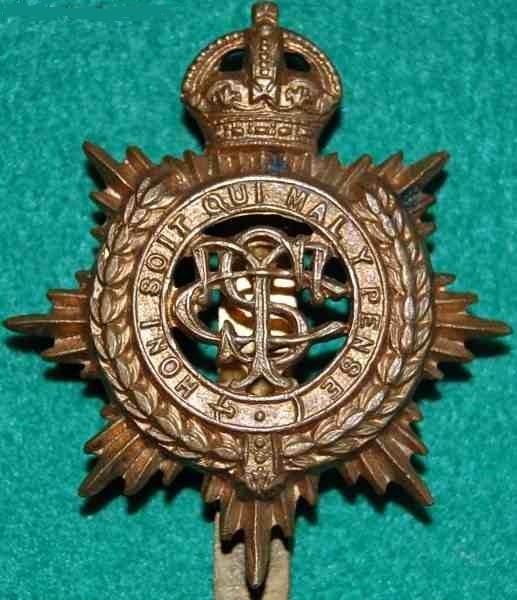 However, before 1915 it might also have been used as part of the Staff Sergeants badge of rank, positioned above the 3 stripes. 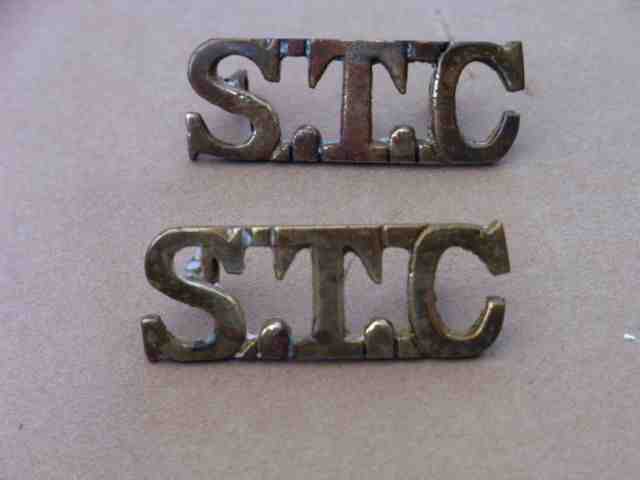 The brass letters are shoulder titles for some of his units (STC = Supply and Transport Corps) and the medal is a 1915 star without its ribbon. I cannot imagine what the connection is with the East Surrey Regt, but one possibility is that he was in an East Surrey Regt Home Guard unit during WW2, if that is the county where he was settled on retirement. I enclose images of the badges that he would have worn in your photos. 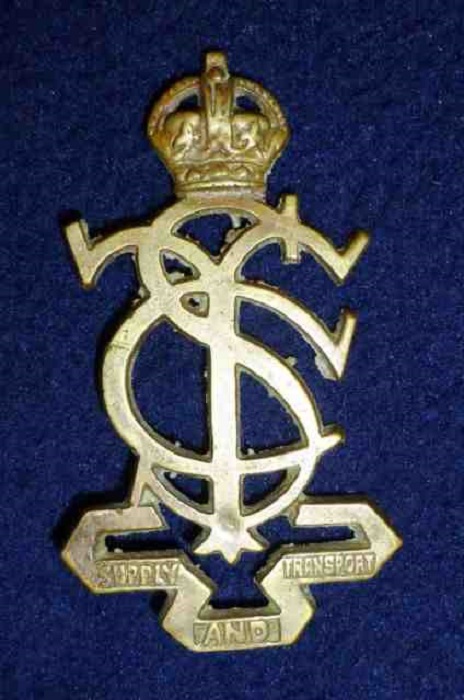 This badge (shown against a blue background) was worn by Indian members of the Supply and Transport Corps (including the mule companies) in their 'pagri' (turban). Like its British Army equivalent, the ASC, the STC was retitled and in 1923, became the Indian Army Service Corps (IASC). It then became Royal (RIASC) in 1935. Thank you so much guys I did not realize when I first posted about uniforms it would turn into something so amazing. I do believe the whole story my Father in law wrote about his Fathers and his time in India would make good reading I could not write it all on here but when you read about the conditions of the forts they were put in and general life there and the horse training etc it really is wonderful reading and probably needs to be preserved . We would gladly share this info .
. The march photo must of been taken just after the war I think as he was living in NZ not long after as his wife Rosetta Askews famlly had moved here to start up a bakery shop like they had in Bedford . The surrey medal seems the odd one maybe it was passed down to him by a family member ....anyway that can be another little adventure for me some other time. We will now look at the site for the lancaster bombers as my husbands father trained there ...another story .